The Most Rev. Joseph P. McFadden, bishop of the Diocese of Harrisburg, Pa. The Alliance for Catholic Education (ACE) at the University of Notre Dame capped its annual “ACE Summer” of formation programs and conferences with a missioning Mass on July 27, sending forth more than 200 teachers and leaders to Catholic schools across the United States. The Most Rev. 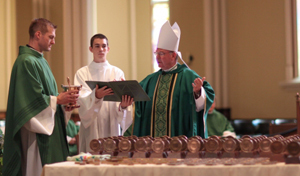 Joseph P. McFadden, bishop of the Diocese of Harrisburg, Pa., presided at the Mass in the Basilica of the Sacred Heart. “Your participation in the ACE program is a great blessing for the Church,” he said in his homily.